A dealer who looks for the best in everybody, and rewards the team for achievements. Completes deals at a highly competitive price and with favorable financing terms (if applicable) and does this quickly and in writing so that there is never any need for the car buyer’s agent (nor end user) to scratch their heads and wonder what deal they are really going to get. Answers their phone when telephone communication is required to consummate and/or fine tune the details of a car lease or purchase. Gives such excellent customer service that Car Pal returns to that dealer regularly and rewards the dealer with repeated volume car purchase business. Brad Hackendahl, general manager for Fred Beans Toyota in Flemington, NJ (formally a sales manager for Conicelli Toyota in Springfield, PA) epitomizes the Car Pal car buying service’s standard of excellence. 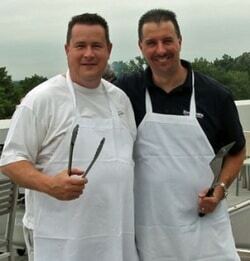 Brad is shown in the photo above as the co-chef for a rooftop BBQ this summer in honor of Fred Beans’ employees and their record breaking sales success for the month of May, 2012. Below is an excerpt from an email communication with Car Pal (with CC to Car Pal’s client, Brian) about a Toyota Prius purchase in 2012. Though this transaction took place nearly two years ago, Brad was so superior with his customer service and attention to details and customer satisfaction, that Car Pal detectives tracked him down to use his fine services for their very first FINRA employee corporate car buying service in October 2013. Attached is a copy of the spec sheet on your car. We will be adding leather/heated seats and back up mirror. We should be good for Saturday delivery. Brian, you can finance 100% if you would like. I’ll be in touch in the next day to set a time for Saturday. Getting the Best Car Deal, For Sale By Owner? What Does a Car Buyer’s Agent or a Car Buying Agent Do?